The diversity and relative abundance of wildlife here in Northern California is one of the many qualities of this area that attracted me to call this location home. With the thought of “abundance” in mind I hope everyone had a great Thanksgiving weekend with family sharing good food and creating lasting memories. 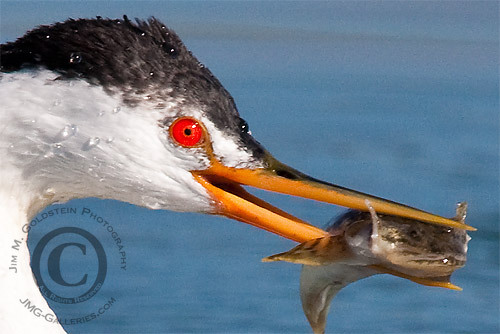 Even at this time of year birds have their feasts, rather than being feasted on, as is evident in this photo of a Clark’s Grebe (Aechmophorus clarkii) holding a fish in it’s beak. I got a chance to enjoy this moment on my last Sea Otter Photo Tour (the next one is on January 23rd, 2010). This photo was taken at a focal length of 840mm (600mm + 1.4x TC) and I was very happy to have still had space to capture the birds reflection in the foreground. Taking a closer look at the photo (see below) you can see a very unhappy fish and some added detail of water droplets on the feathers of the Grebe. While this isn’t quite a 1:1 crop you can really see how much detail resides in 20+ megapixel image. I have to admit I still get a little giddy when I zoom in on a photo like this. The lack of film grain is something I still enjoy quite a bit in my wildlife photographs.